Inspiring, practical and richly photographed, this comprehensive guide offers creative ideas and DIY projects using beautiful low-maintenance, water-wise plants Succulents are the ultimate easy-care plant: versatile, effortless to grow both indoors and outdoors, and drought tolerant. 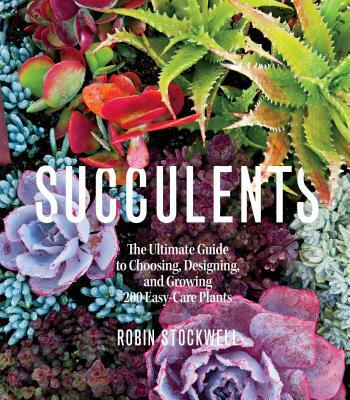 From Aloe and Agaves, to Senecio and Taciveria, this handbook by leading garden expert Robin Stockwell highlights 200 of the easiest, most useful, and gorgeous plants, and shares advice on care and cultivation. Readers will find inspiration for imaginative and exciting new ways to use succulents in striking garden designs, containers, vertical walls, and indoor arrangements, as well as step-by-step projects, such as living bouquets and terrarium ornaments.This is the essential reference for landscapers, home gardeners, and anyone looking for a thorough introduction to the perfect plant for modern times. Robin Stockwell is the founder of Succulent Gardens in Castroville, CA. He has been active in the nursery industry as a grower and retailer, and working with succulent plants since 1972. Robin has received numerous awards and has been featured in newspapers, magazines, and television.